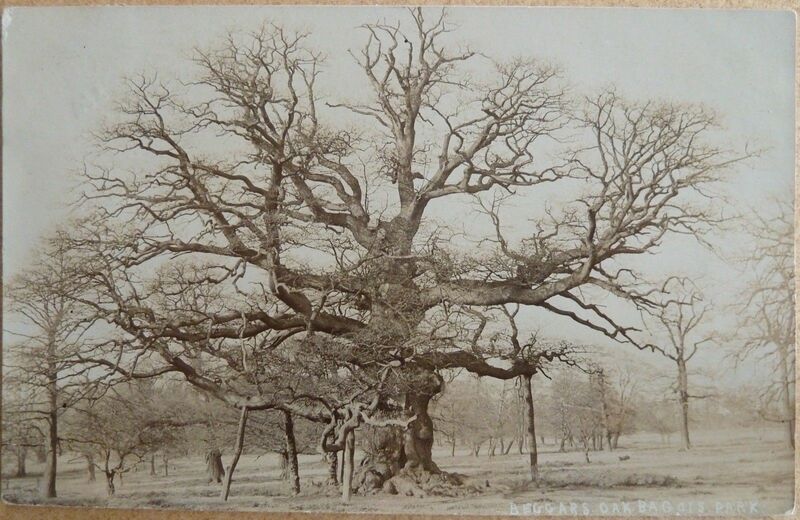 The Beggar’s Oak at Bagot’s Park. The Beggar’s Oak at Bagot’s Park, near Abbots Bromley. At Bagot’s Park a “Beggar’s Oak, beneath whose branches, so the popular belief has it, any wayfarer has the right to a night’s lodging. [This seems to indicate] some prehistoric common right, disregarded at the time of the enclosure, but still existing in the popular imagination”. — from Charlotte S. Burne, “What Folkore is, and how it is to be collected”, North Staffordshire Naturalists’ Field Club, Annual Report and Transactions, 1896. Presumably the various “Beggar’s Bush” pub names of the West Midlands also arise from this forgotten ‘sanctuary’ tree tradition, e.g. the pub on what is now the edge of the ancient Sutton Park. Previous Post Multiview postcard of Stone. Next Post The Greenhouses, Hanley Park.